Attending a swimming pool a person gets fit, relaxes, unwinds after a hard day. But together with all the assets of spending time in water there are certain pitfalls, which are common for pools meant for fitness swimming, those in hotels and in general any pools used by many people. The matter is in the water that is being processed in order to kill all the bacteria and microorganisms that may be present in it. It may affect skin, eyes and hair in a negative way. People that spend much time in pools know that the water cleansed by chlorination or with the help of silver ions can leave the sense of excessive dryness of both hair and skin including that of the scalp. Some people complain that due to the effect of such water their locks feel coarse and then start to fall, especially after washing. This is a signal of serious troubles, but fortunately, everything can be restored. The first thing one must have in order to prevent hair from getting damaged by the pool water is the cap. Sportsmen and those, who are fond of swimming, use the best ones that cost pretty much, too. The most effective caps, which do not let water under, are made of silicon. They do not pull out hairs and feel rather comfortable, but in any case, it is recommended to apply a special care agent that will protect the scalp and locks from the ruining influence. There are many well-known means that can be applied onto one’s hair before and after going to the pool, but some of them, melting in the warmth under the cap, can leak through and leave the oily trace on the surface of the water. This is rather unpleasant, so it is better not to use such substances. Instead, it is possible to use remedies that can repair the damage after swimming. The first thing one needs to do is rinse the head in running water, for instance, in a shower, in order to delete the remnants of the chemical agents. These agents can also affect blond hair giving it the distinct greenish hue. The best way to get rid of chlorine is to use a deep cleansing shampoo. Though they can be of different types and those that contain powerful adsorbents can as well deprive hairs of their vital moisture leaving them dry in any case. When choosing such a shampoo, it is necessary to find the one, which is suitable for even the everyday usage and that leaves the sense of softness and well-moisturized locks. My recommendation for removing chlorine on hair is UltraSwim Chlorine-Removal Shampoo. Such shampoos in usage do not differ from any other regular ones, so they can be used immediately after swimming or as soon as possible at home. It is important to let the hair get dry in the natural way, avoiding making it even dryer with the help of a fan. Another good idea is to treat the damaged locks with special masks, balsams and conditioners. They can be used several times a week, but not too often, as long as excessive nourishing is not good for hair as well. Such agents are mostly applied onto a wet head and massaged thoroughly in order to let the components get to the follicles. 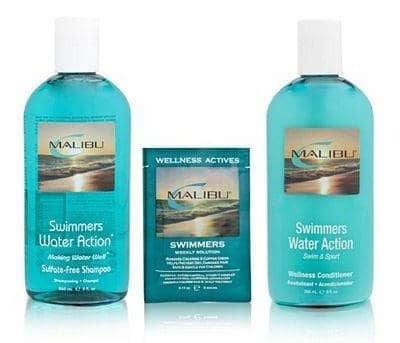 For example, Malibu Wellness Swimmers Wellness Kit Hair Care Product Sets. This product combine features of shampoo, conditioner, nutrition and moisturizer at once. It also makes sense to use the so called “solar” remedies that are meant for restoration of the damage caused by the sun. This is most of all reasonable when having a rest beside a swimming pool at a hot summer resort.